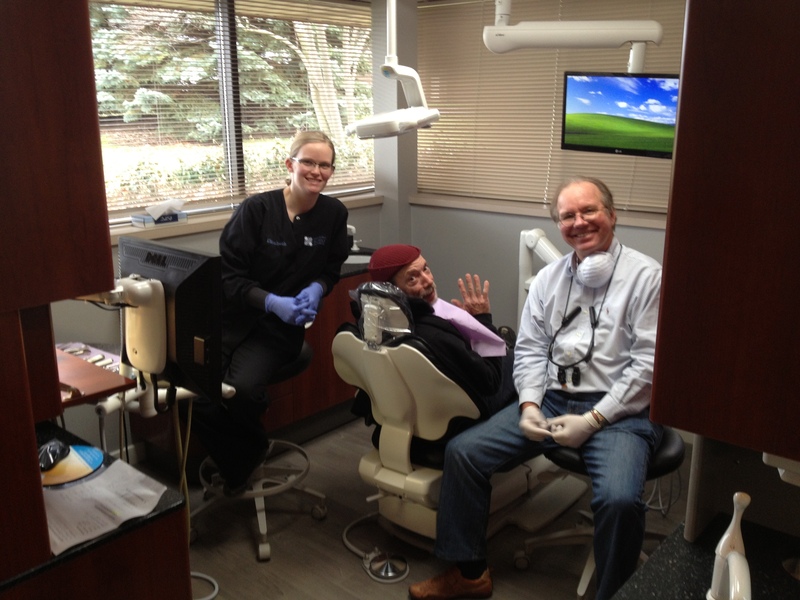 Elizabeth Steenwyck and Dr. Tom Northway, at right, assist a veteran in need of dental care. One of Dr. Tom Northway’s friendliest dental assistants is large and fuzzy. He speaks no English but is a great communicator all the same. He’s an immense dog named Tanner, a 180- pound Leonberger, pictured above with Dr. Tom Northway, at left, meeting veterans regularly on walks in Grand Rapids, Michigan. “It breaks your heart when you see five guys living underneath a bridge,” Dr. Northway says. “Then you find out most of them are veterans. It’s hard to believe there are that many homeless vets without any care.” Spurred on by his longtime Benco Dental Equipment Specialist, Lou Ellis (himself an Air Force veteran), Dr. Northway last December 5 volunteered a day to giving those vets much-needed dental treatment. For seven hours, he and his associates at Northway Dental, as well as a neighboring oral surgeon, gave 55 veterans more than $18,000 in free dentistry. “When I went out to welcome them, everyone shook my hand,” Dr. Northway says. “It was heart-wrenching how appreciative they were.” He hopes to host more free clinics in the future — and spur others to do the same: “Hopefully it’ll act as a catalyst to get other doctors out of their comfort zone and realize, yes, it’s always worth it,” he says. Until then, he and Tanner will make their rounds, seeking out additional ex-soldiers who might need assistance. Benco Dental is supporting our Veterans by hosting a fundraiser today, during which associates at Benco headquarters in Pittston, Pa., can wear jeans to work by making a donation to support the Wounded Warrior Fund. As with all associate fundraisers, Benco matches the donations. Massachusetts Dental Society, which organized 31 member practices across the state to provide free dental care to local veterans on November 7. Orange County, Va (WVIR), – a dental clinic in Orange County – which is giving some former service members a reason to smile this Veterans Day.